Could the Earth Become a ‘Waterworld’? I fall in the column of people who thought the film was a bit of a turkey. Sure, it was impressive in some respects, but the story and characters weren’t enough to keep me interested. There was also this little thing called “science” that bothered me throughout the film. This wasn’t a sticking point for other famous flops from the 90s like Cutthroat Island, The 13th Warrior, and Costner’s other albatross The Postman. Those really weren’t science fiction per se. But Waterworld was. 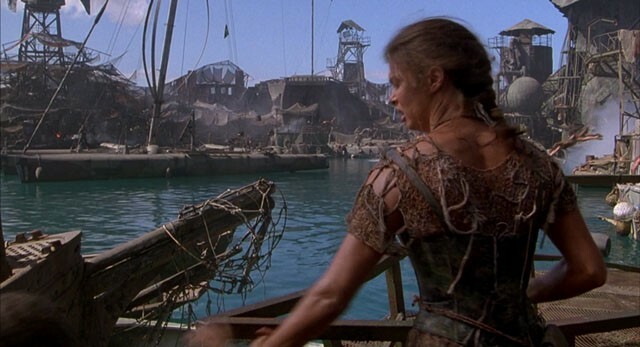 And looking back almost twenty years, that got me thinking: How realistic were the events of Waterworld? The Answer: Not a damn bit. The premise of Waterworld is quite simple: Years of global warming has heated the atmosphere of Earth to the point that all ice deposits have melted. That includes all sea ice, ice bergs, and polar ice caps. The result is a rise in sea levels that covers the entirety of the land on the planet. In fact, the flooding is so overwhelming that the mile-high city of Denver is completely submerged (which we know because Costner’s character of The Mariner dives there to collect dirt and other trinkets to sell). In fact, the only remaining dry land is at the tippy-top of Mt. Everest, where the characters eventually end up at the end of the film. Before you stampede to the comments section and accuse me of denying global warming or conversely accuse me of playing doom-and-gloom with environmental fact, keep in mind that this flooding-the-earth scenario is not supported by any scientific evidence. There simply isn’t enough ice on the planet to raise the sea level enough to get Denver wet, let alone submerge it under hundreds of feet of water. Much of the ice that concerns environmentalists is sea ice and ice bergs, not because of flooding potential but rather as an indicator of rising temperatures across the globe. The ice already floating in the sea could melt in its entirety, and it wouldn’t change sea levels at all. This is because floating ice, which floats because its volume is larger than it would be in liquid form, already displaces its surrounding water as it would if it were melted. So while melting sea ice is a concern, it wouldn’t affect sea levels. While the Indian Ocean would encroach on the foothills leading up to Mt. Everest, that 29,000-foot-tall mountain would be untouched by the new sea level. To reach this level, approximately 4.6 billion cubic kilometers of water would be needed, which is more than three times the amount of water on the planet Earth. Part of what makes the Mariner a mysterious character is that he has a mutation perfectly suited for the new world of water. Not only does he have webbed feet, but he also has gills behind his ears, which allows him to breathe under water and dive to street level in Denver. Unfortunately, in spite of what the X-Men movies have taught us about explosive mutations, evolution doesn’t work this way. It took fish the entire Devoian Era (known by some as “The Age of Fishes”) to evolve lungs and legs and crawl onto the land. This represents a time span of approximately 60 million years, or the equivalent amount of time that has passed since the dinosaurs left the planet. While the movie Waterworld does not define an exact time frame over which the world has changed, the trailers state “hundreds of years.” To put things in perspective, humans haven’t evolved much in the 400 years since the time of Shakespeare. Simply finding themselves on boats for a couple hundred years wouldn’t cause evolution like this. Even worse, the Mariner is discovered to be a mutant after he refuses to mate with the daughter of one of the families living on the Atoll. The reason they give for needing to mate is that their gene pool has become shallow from interbreeding, and they needed fresh blood. Of course, this is the most shockingly ethnically diverse group of inbreeders I’ve ever seen. The family in question is Asian, the man standing behind them is black, and the people around them are white. An intermingled gene pool as described should exhjibit extremely similar features rather than clearly-defined races. Even in a short 500 years of inbreeding, the people on this structure would have become to look similar. 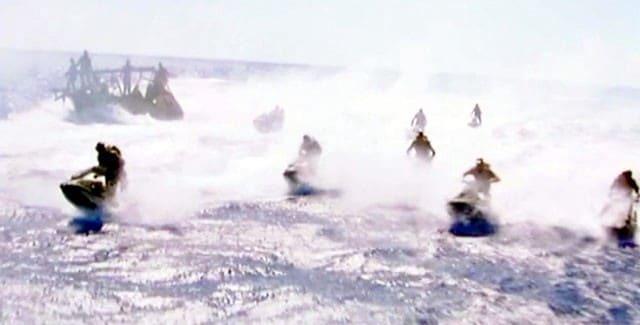 Who employs a moist army on jet skis. Dennis Hopper plays the villain in Waterworld, riding the high seas on the environmentally significant and symbolic Exxon Valdez oil tanker. His team of wet bandits have high-caliber weapons on board and get around the water on jet skis. However, the Exxon Valdez was an oil tanker, not a gasoline truck. It carried crude oil, which spilled into Prince William Sound in 1989. Sure, crude oil contains gasoline, but there’s a lot of other things mixed in there as well. The process of oil refining is complex and closely monitored. It involves cooking the crude oil and distilling it into various forms, ranging from fuel oil to methane. Jet skis run on 87 octane gasoline, just like most automobiles. You can’t just pour this inky solution into your gas tank and expect an internal combustion engine to work well… or at all. So, while Waterworld has some cool action moments, interesting production features, and a firm place in cinema history for environmental activism in the shadow of excess, it’s not a specific danger in our future. For a better science fiction action film that takes place with the threat of rising sea levels, may I suggest Split Second with Rutger Hauer and Kim Cattrall.